This past Tuesday, ASTU 100A’s Archives Project Showcase featured five research projects which were based on archival materials found in UBC’s Rare Books And Special Collections (RBSC). By making these materials more accessible to the public, the goal of each project was to make a public contribution to knowledge where there had previously been a knowledge gap. 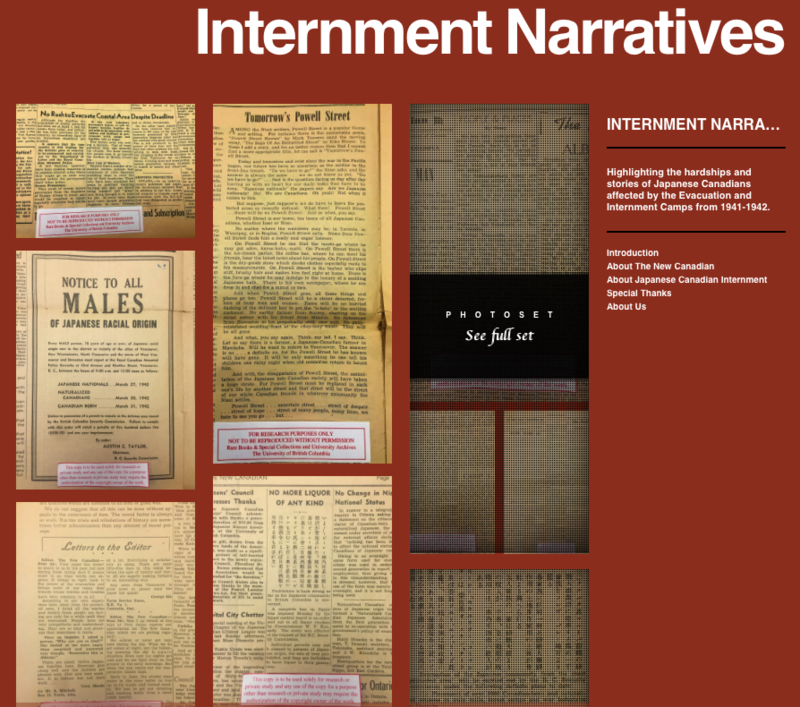 A glimpse of the Internment Narratives website. 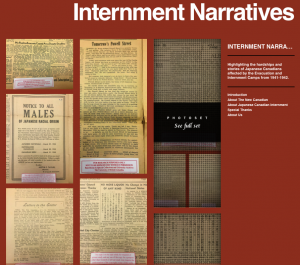 One project I am especially interested in is Internment Narratives. Researched and presented by ASTU students Tima Johnson, Jewel Pang, Will Shelling, and Rachel Teasdale, Internment Narratives aims to bring insight into the lives of Japanese Canadians prior to their internments through the use of articles found in the Japanese Canadian Research Collection. This website can be used by both students and teachers to “supplement the current knowledge” and tell narratives from a different point of view. The group’s decision to use Tumblr as their platform is particularly effective because of how easily accessible it is to high school students and educators as well as the general public. Information which, previously, was only accessible in person through RBSC is now organized onto a website accessible to anyone who has the link. Tumblr is a blogging website founded by David Karp in 2013. In her quantitative study of the use of Tumblr by librarians and archivists, Katie Elson Anderson presents findings which indicate a “growing library presence” on the microblogging website amongst various types of libraries and archives (e.g. special collections, academic libraries, public libraries). So why are librarians and archivists turning to Tumblr? Blogger L. K. Fitzpatrick argues for the use of Tumblr as a platform for archives, and she also acknowledges my point about the accessibility of Tumblr. Furthermore, she argues that not only is it free and easy to use, but its reblog feature also allows for the circulation of archival content, while its follow/subscription features make it convenient for users to stay connected. Today’s Document is a fine example of archivists turning to Tumblr to display archival materials. 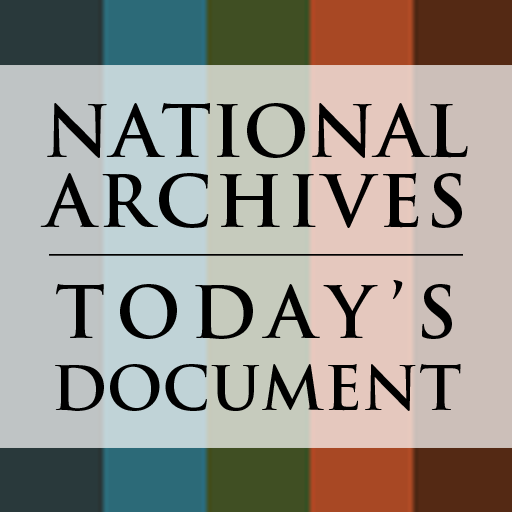 It features “both the well-known and the obscure” materials from the National Archives website, with the intention of circulating documents from the U.S. National Archives. Its popularity has led to both a mobile app as well as a tribute site. Evidently, the move to Tumblr has greatly contributed to the exposure of these documents and has significantly benefitted their users. This is only one example of a successful “Tumblr archive”; Smithsonian Archives of American Art and the University of Illinois at Chicago Special Collections blog are both successful and interesting archives worth checking out. 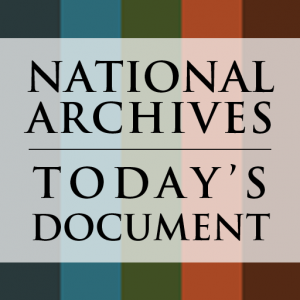 For much of the public who may be unaware of the physical archival resources available to them, a Tumblr website is certainly an effective platform for publicizing archival materials. “About Today’s Document”. todaysdocument.tumblr.com, n.d. Web. 10 Feb. 2016. Anderson, Katie Elson. Reference Services Review: Libraries and Tumblr: A Quantitative Analysis. 43 Vol. Emerald Group Publishing Limited, 06/08/2015. Web. 10 Feb. 2016. Fitzpatrick, L. K. “Tumblr And Why Archives Should Try It”. archivalor.wordpress.com, August 2014. Web. 10 Feb. 2016. Johnson, Tima, Jewel Pang, Will Shelling and Rachel Teasdale. “Introduction”. internmentnarratives.tumblr.com, February 2016. Web. 10 Feb. 2016.